I have my first project to show you all! This is done by Pat Moran. Pat lives in Melbourne Florida. I met Pat several years ago on the internet. We belong to a small group called "The Puter Pals". Pat used to live up in Coos Bay Oregon. When she moved to Florida we were lucky to meet each other. On her way she was able to stop and stay with us. We had a wonderful visit and became fast friends. 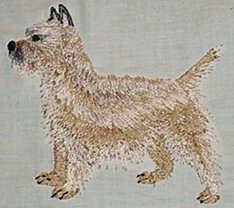 Pat is new to machine embroidery and just got a Singer Quantum XL1000. 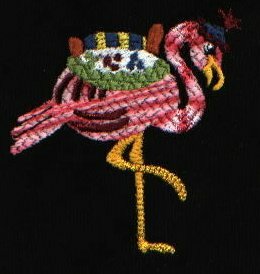 She is doing testing for me and has come a long way with her embroidery. She decided to do her testing of our Spring Flowers on some towels. So here is a picture of them. Click on the picture to see a larger image. 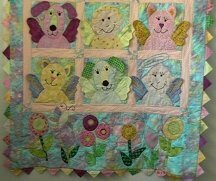 I just got this new picture from Pat showing here very first quilt and pillow using my Easter designs. I don't think Pat is sleeping. I think she has become addicted to her sewing machine! If this is an indication of Pat's skill on the machine with her first quilt ever ,I think she is going to excel in quilting and become a prize winner. 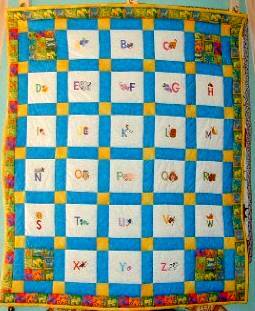 I just finished the Double Duty Alphabet Quilt for my grandsons Kolby and Logan. It will be in the mail to them shortly. It is going to be used as a learning tool besides a cuddly quilt. 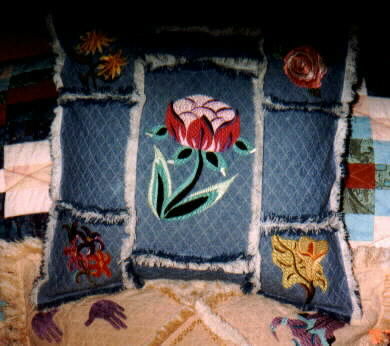 The picture was taken with my digital camera and does not show the quilt at it's best. I am very pleased with it but as soon as I have the pictures from my regular camera developed I will trade this one out if they come out better. But I wanted to share this with you now so I went ahead and put the picture up. This is my good friend Connie Mallette. She is a master knitter and a great sewist. Connie does a lot of good works in our community one of them being the coordinator for the Linus project with our knitting guild. She also does a lot for her church and other charity projects. She is also my savior when it comes to explaining complicated knitting patterns. She never hesitates to help anyone. She is also a breast cancer survivor. I am honored to know her and count her as a friend. 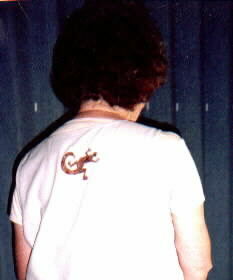 The first two pictures are of Connie with the Gecko on her jumper. I have just added two more pictures, of Connie and me. Connie is wearing her other dress that she used the Chili Peppers from the South West Collection on the front and the back. I thought it was a real cute addition to the back hem. Click on the images to see the large image. This is a special project I am working on. It is using a certain fabric called Sand Castle by Dan River. I am working on several techniques using it for a class I will be teaching in the fall. These pillows are my first proto types. I have used designs from South West I and II and Large Folk flowers and the Spring Flowers collections. 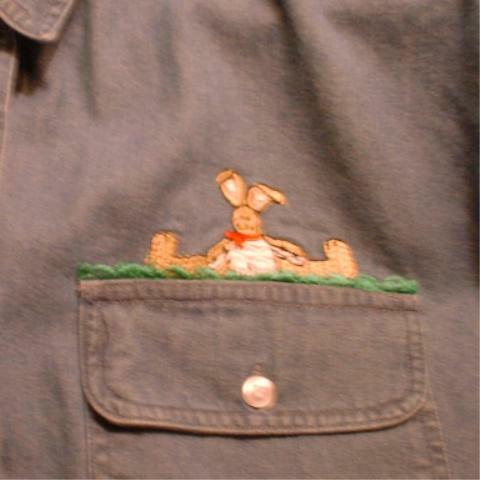 This is a shirt that Bev Moughler used to put on the Easter Bunny Pocket Topper. 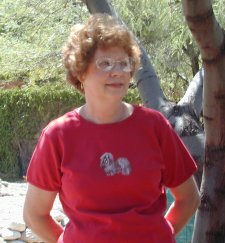 Bev has a Janome 9000 and is the organizer and planner for Arizona Sewnsews. 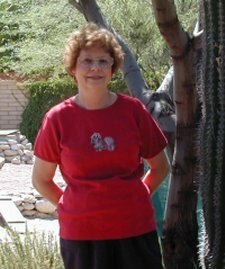 She has been generously been giving her time and talents to get sewists in Arizona together for monthly meetings and classes. If you live in Arizona and would like to be part of this active group, write to Bev. Bev is also a tester for me and gives me good step by step information about the designs she stitches out. This shirt (I wish I had a picture of Bev in it) is a good example of what to do if something is not aligned perfectly. Bev put some grass under the bunny and it made it look perfect! So never think something isn't perfect. We can fix anything with our Magical Machines! 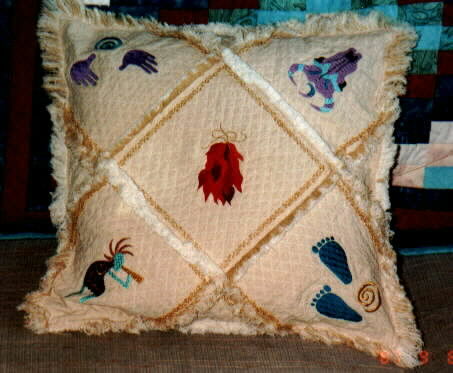 These projects are done by Kathy Riley. 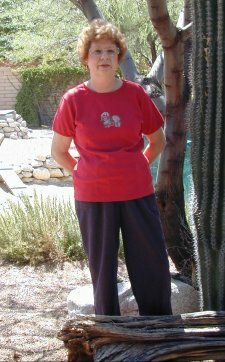 Kathy lives in Tucson Arizona and has a Sears model 19001 machine. When she got her machine she barely knew how to thread it. But she is an experienced sewist. She came to me for lessons and I took her though the basics and now there are things that she can teach me! Her work is flawless. The below examples are just a tiny taste of what she can do. The first is the Carousel Horse on the carousel. I think Kathy is going to have it framed. 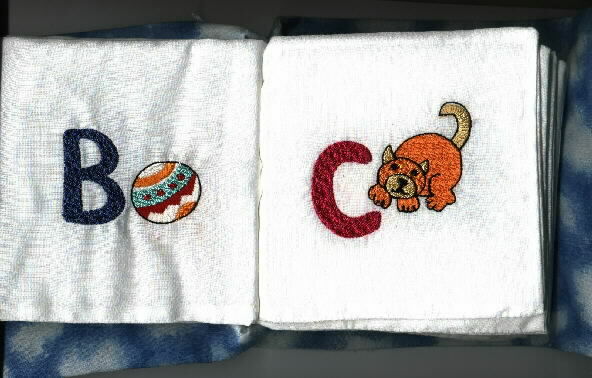 The others are two pages from a soft book that she made for her nephews new baby boy. I am sorry I don't have more pictures of the book. Please click on the pictures to see a larger view. I hope to be able to show a lot more of Kathy's work soon. 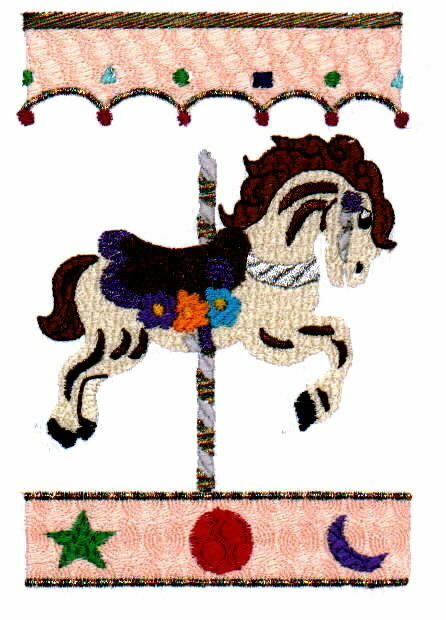 Here are more of the Carousel designs that Kathy has done on black. I was so pleased with these. She is so creative! Be sure to click on them to see a larger image! Karen is one of my favorite customers. 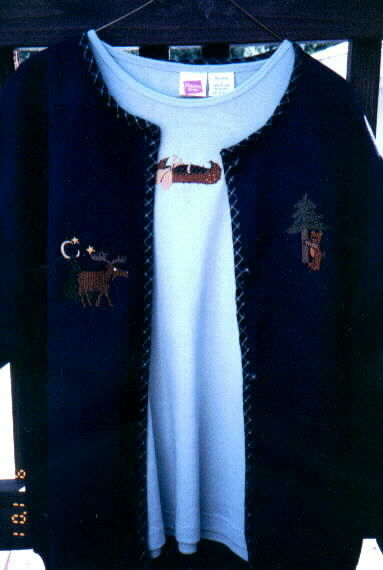 She just sent me these pictures of some garments that she has used the "Kamp Kolby" designs on. Karen lives in Pennsylvania. Thank you Karen! These are some of the projects that I have been stitching away on for my own family. 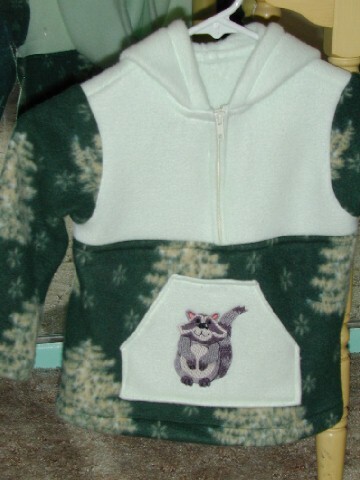 The jackets are of polar fleece and have hoods. 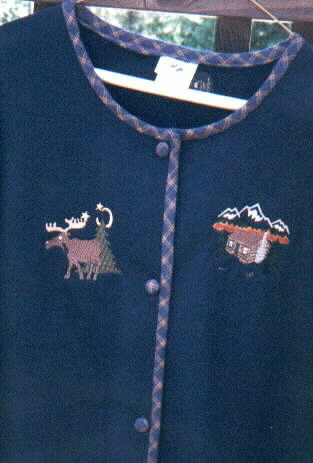 Polar fleece is very nice to stitch on. Because I am so busy digitizing all the time, stopping to actually sew is like a vacation for me. 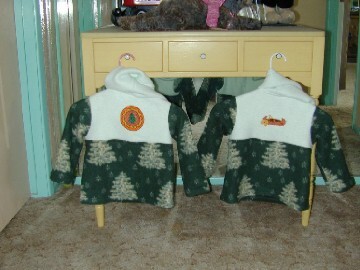 The jackets are for Kolby and Logan who are 4 and 2 years old. I wanted them to look like big boys as I am sure they do not think of themselves as babies any more. 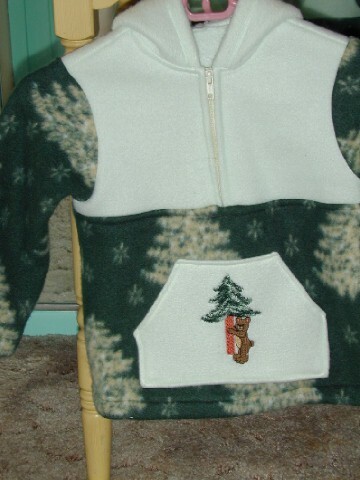 The designs that I used on them are from my Kamp Kolby collection. 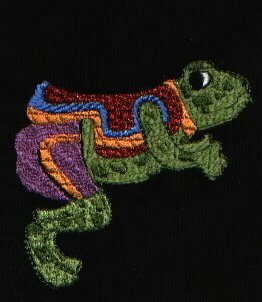 Since they were actually the inspiration of these designs drawn by their mother Debbie, it should make the jackets very special for them. As soon as I have pictures of the boys wearing them I will post them. 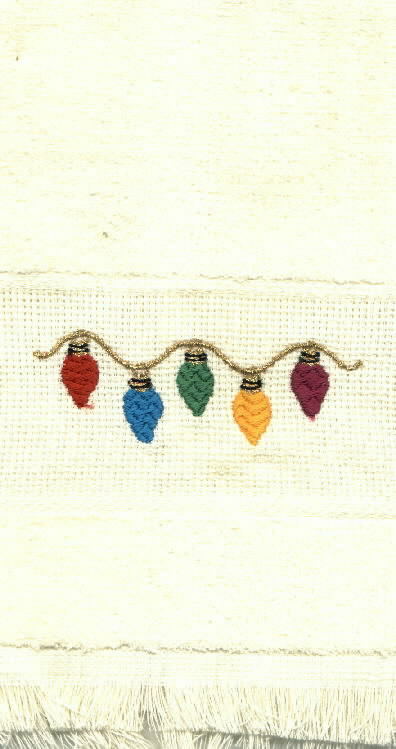 The second project is a couple of hand towel that I have done for Debbie to put up for Christmas. I rarely have the time to do anything for her and so she has hardly anything stitched to show of all of her wonderful drawings. 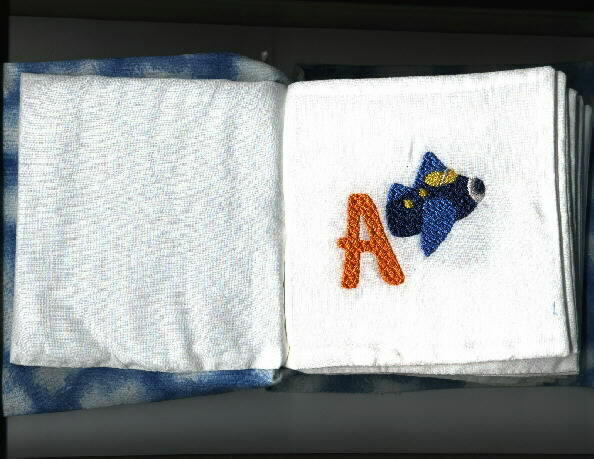 The towels have designs from the new Christmas sets. They are actually pocket toppers but are perfect for towels and pillow cases and sheets and napkins and actually everything! Diane Bacon took my Holiday Hoop class in Fairfax Virginia. This is one of the Christmas Ornaments that she made for Moriah. You can see Diane's hoop on the Holiday Hoop Page. 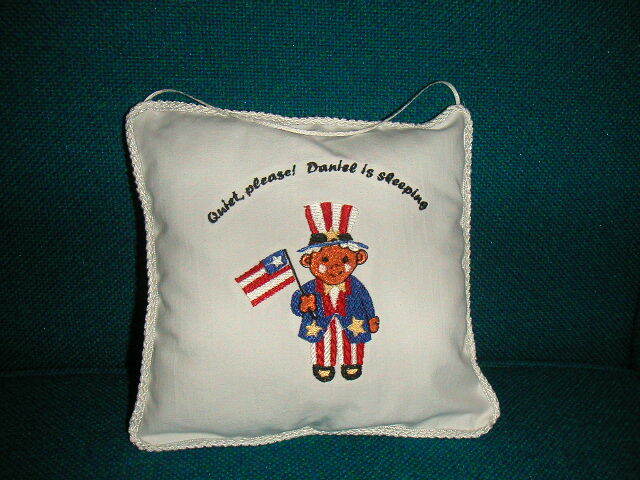 Here is a picture of the door hanging that Gayle made for her future grandson "Daniel" who will be born in Germany. She wants him to know he is and American. The design is from our "Hoo Ray For The Red White And Blue" collection. Be sure to click on it for a larger view. 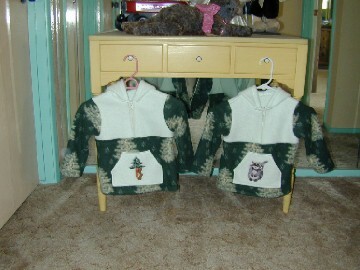 These were stitched by Terri Harper for her grandaughters, Mackenzie and Madison. 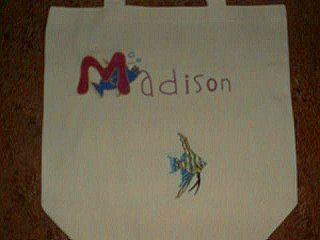 She used the Puffy Foam designs from the "Aquarium Fish" collection. 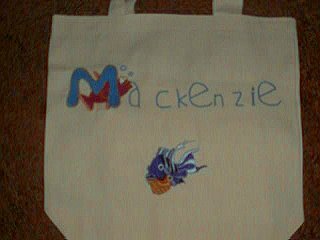 I am sure they will have many happy days of use from these bags and always think of their grandmother when they use them. Be sure to click for a larger view! Here are three views of Marilyn in her Shih Tzu shirt. 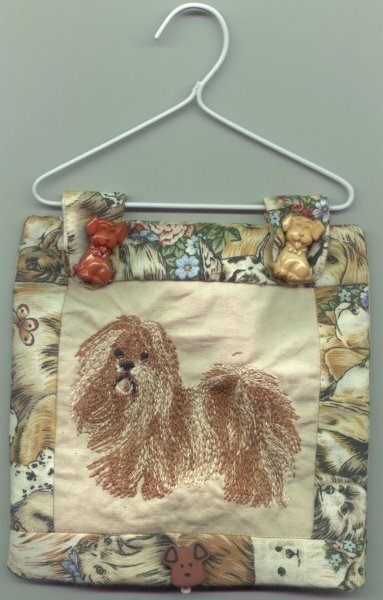 This was a very special design for Marilyn as she breeds Shih Tzus. Marilyn stitches on a Janome 9000 and is an expert seamstress and quilter and knitter. She is also a very good friend and we even went to the same grade school in Sacramento California. She moved to Michigan before high school so we did not see each other again until we both moved to Tucson Arizona . Then we met at the American Sewing Guild and the Knitters Guild of America. We had no idea who we were until one day when we started chatting about where we were from. When we found out the connection we laughed for hours. We were even born in the same hospital! You just never know who you will meet. There was over 30 years that we had not seen each other. We have taught sewing and stitching classes together and plan to do more in the future. Marilyn is also on the Holiday Hoop Page. Hi my name is Marda Frie and I live in ST. Louis, MO. The wall hanging is for me. 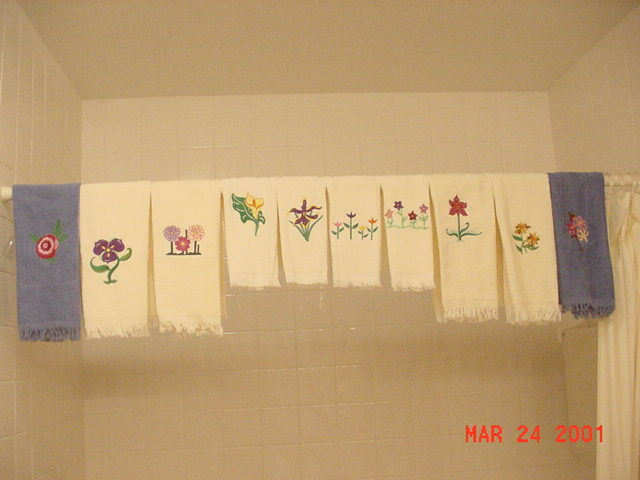 I am going to make a bunch of them and hang on an area in the kitchen that is a little bit wider than the hanging. It is the space between the door and where the cabinets begin.Since the coat hangar, the original ones I wanted were the black ones with hearts are hard to find, I am going to use wire, which I will twist and use as the hanging part as the hanger. .It was done on the Brother Ult 2001. I am playing in PED 4.0 with wild colors to determine which layering is which to match my other Shih Tzus.The reason I stayed with the variegated color is it is more realistic to my eldest Shih Tzu who is 16 years old, blind and deaf and still a love (VBG). I had to buy buttons because, you know the reason...all of the doggie buttons I have of course, I couldn't find them (VBG)This is giving me a chance to use up my 30# threads in cotton and rayon that I used with the NH 8000.
that I have bought. It really has a 3 dimensional effect which I adore. Hi I’m Dianne Linley. I live on Lake Bridgeport, in Texas. myself and purchased a Brother 8500 . 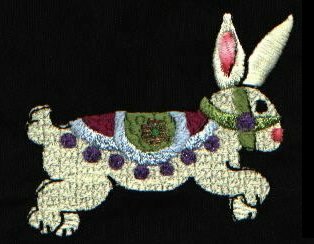 As I began to see 'themes' for quilts in my embroidery, I took up quilting. Thank you Randi, from the bottom of my heart! 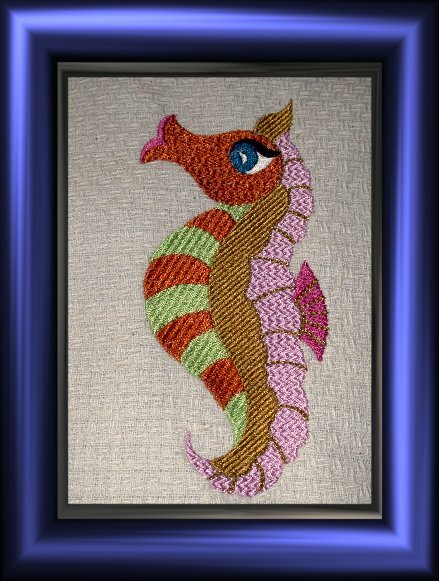 Beverly Held sent me this large Seahorse from "By The Sea II". 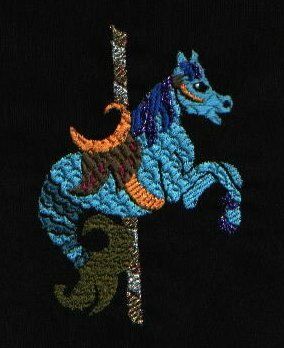 She did some experimenting and used metallic thread. I think it is gorgeous! I put it in a frame to show what a great wall hanging you could have with just one little design. Can you imagine a collection of these framed in your bathroom or anywhere? Thanks Beverly! Marge lives in a little town called Sedro Woolley WA. She uses the Viking D1. She teaches embroidery and all of the basics. She used the Aquarium fish with Puffy Foam for a class. 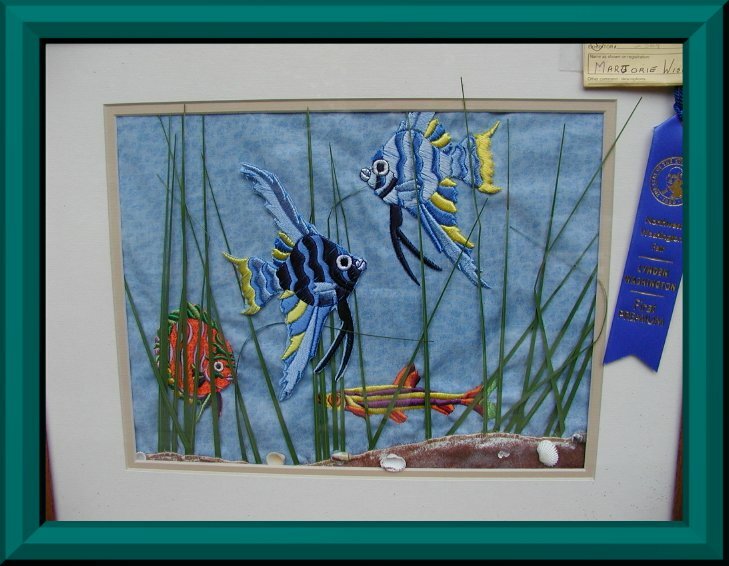 Then she entered hers in the local fair and as you can see she won a Blue Ribbon. Marge has a good time picking out projects for her classes and keeps her students busy! She has a weekly meeting with them at someones home and it is her job to come up with the new projects so they can learn their machines. 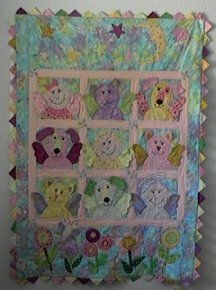 I just finished this quilt for my husbands great granddaughter Avery. 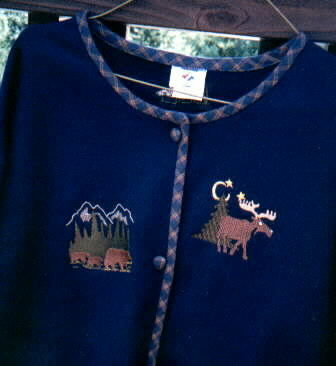 It does not have machine embroidery designs but I did do free hand machine embroidery and machine quilting. 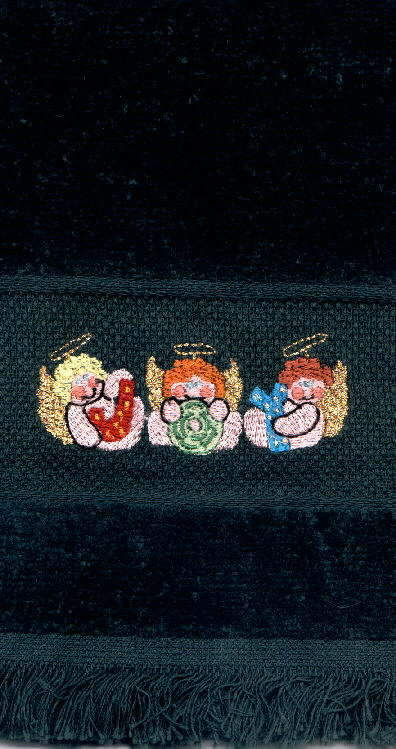 The pattern is called "Angel Babies" and is from a booklet called "Krazy For Babies " by Mary Lou & Company. http://www.marylouandcompany.com . The instructions and patterns are very well done. 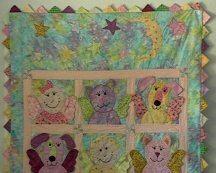 I had a lot of fun constructing this quilt but did not get a lot of digitizing done while I was doing it. I wanted to get these up and the pictures are from my digital camera. The lighting was not quite right so when I get my regular photos I will exchange them. 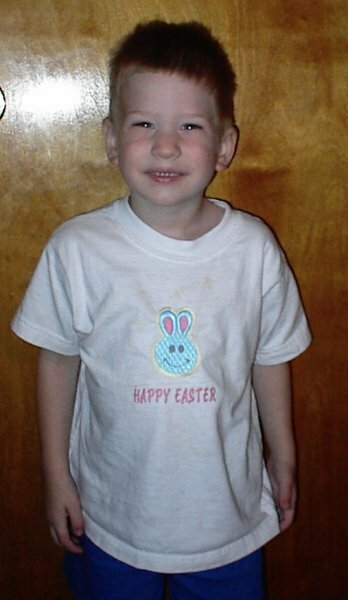 This is Connor. He is 3 1/2 and lives in New Orleans. Click on his pictures to see a larger view. 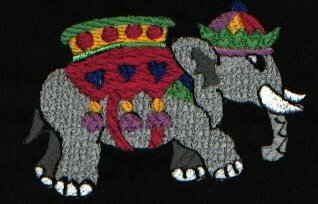 His mother's name is Lisa and she got this design from the free designs I have on Embroidery Billboard. Here is a little bit about her. 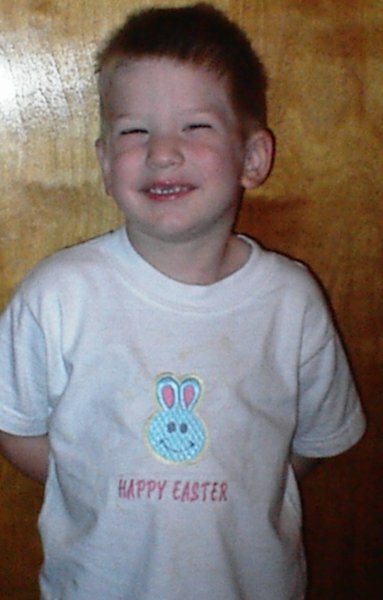 I have 2 sons – Alex is 8, Connor is 3 ½. I’m very new to embroidery – I bought a Brother PE-150 in September of last year. After playing with it for a few months, I finally feel like I’m “good” at it. 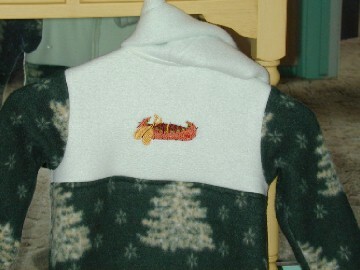 I am having so much fun sewing things for my kids (and for my family & friends). 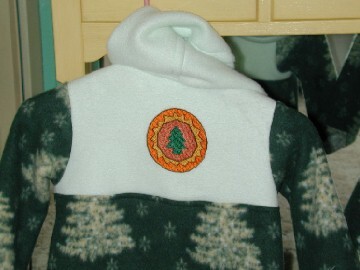 I’ve embroidered just about every piece of clothing my kids own! 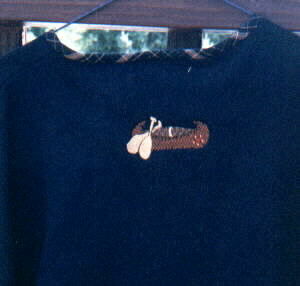 I knew I had gone overboard with this when my 3 ½ year old asked me to sew something on his underwear. (In case you’re wondering, I didn’t sew anything on the underwear). I bought my machine with the intention of sewing my husband’s company name on his work shirts. Last year I paid someone to do it. When I saw that Brother had come out with a $500 machine, I thought it may be worth the investment. So far, I haven’t done any of his work shirts. 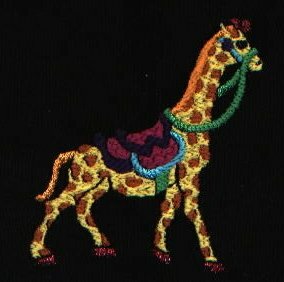 To get this free design, you need to be a member of Embroidery Billboard.